The Bibliography project began in early 2010, and was inspired by meetings and discussions with several colleagues working in diverse institutions in Washington, DC, who were dedicated to the United States adopting a National Action Plan (NAP) in support of UNSCR 1325. At a meeting in December 2010 at the U.S. Department of State, Melanne Verveer, Ambassador-at-large for Global Women’s Issues, asked for assistance from the group in delivering “evidence” to provide a rationale for a U.S. National Action Plan. At the meeting, Barbara Miller, former director of GGP (now known as GEIA) raised her hand and offered to help. The Bibliography is one step in delivering on that commitment. 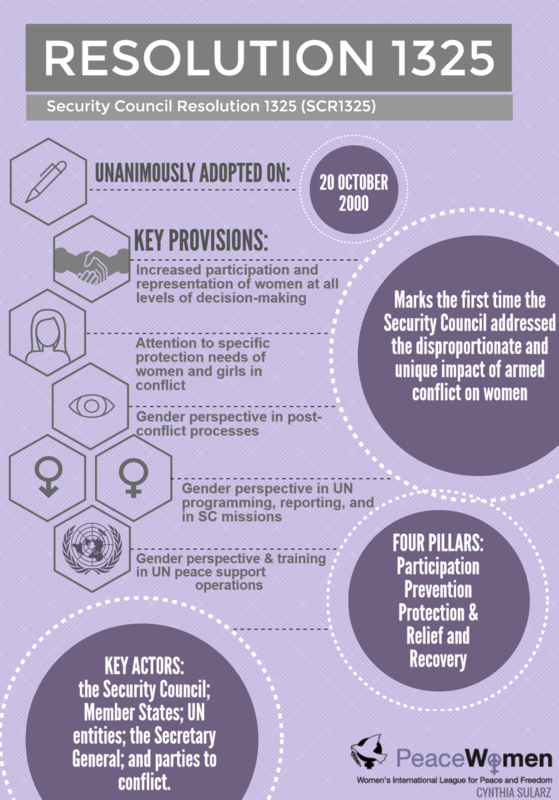 UNSCR 1325 affirms the critical importance of women’s equal participation and full involvement in all efforts to maintain and promote global and local peace and security. Two subsequent resolutions, UNSCR 1820 and UNSCR 1888, call on the international community to address the issue of widespread sexual violence in conflict. 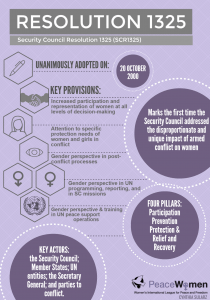 As of September 1, 2012, twelve years since the adoption of UNSCR 1325 in October 2000, 38 countries have created a NAP to facilitate the implementation of UNSCR 1325’s tenets. In addition, several organizations have developed their own NAPs; this includes the European Union (EU), the North Atlantic Treaty Organization (NATO), and the United Nations (UN). On December 19, 2011, the United States adopted its NAP. Preceding that achievement, many town hall meetings across the country were held. In Washington, DC, a civil society group comprising representatives of many activist and policy organizations dedicated to women’s rights played a strong role in making recommendations to the U.S. government units developing the NAP. Over many months in 2011 and 2012, discussions in Washington, DC, continued to focus on “evidence” needed to support the underlying rationale of a U.S. NAP, specifically a rationale related to U.S. national security. The stated need for “evidence” about the importance of including women in all aspects of peace, security, and development inspired this Bibliography. It was one of the first endeavors of GW’s Global Gender Program, now known as the Gender Equality Initiative in International Affairs (GEIA). It is part of GEIA’s ongoing efforts to bring together and assess “what we know” about the benefits of including women in all aspects of peace, security, and development, as well as the costs of not doing so. The 1325 Bibliography, as we have nicknamed it, demonstrates the breadth of scholarship, policy and advocacy writing, and applied work that has been done on topics related to UNSCR 1325. As of September 1, 2012, the 1325 Bibliography includes nearly 2,000 sources, providing a useful research tool for scholars and practitioners.